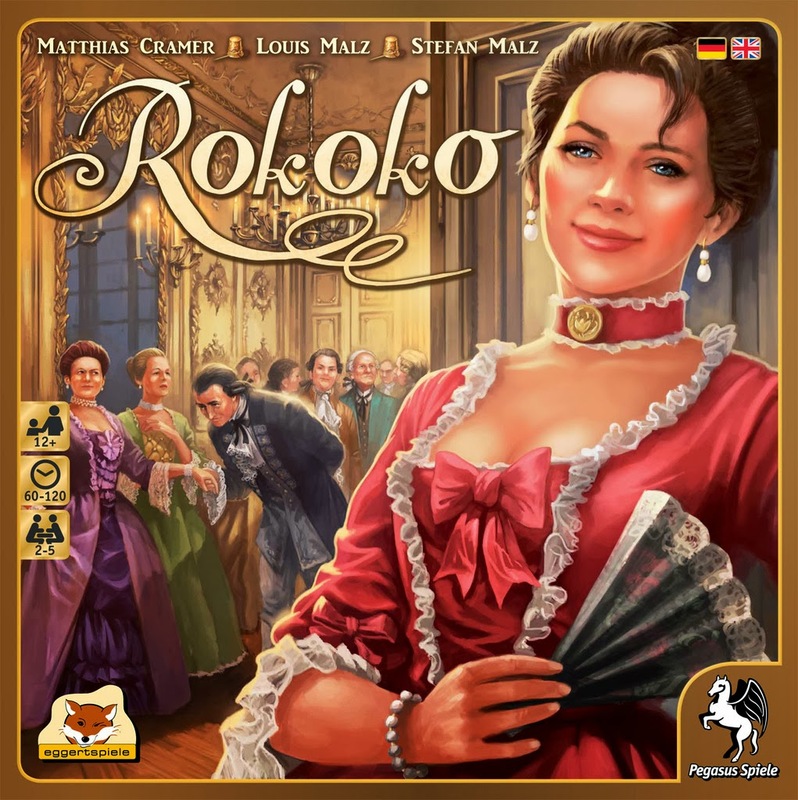 In Rokoko, the players are all running a dressmaking business whereby they have been commissioned to make dresses for the prestigious guests that are attending a very lavish ball. Along the way you are also trying to donate money towards the ball so that you may be known far and wide as not only an excellent dressmaker but a very generous one as well. I seriously can’t believe I just wrote that whole slew of nonsense; doesn’t even make much sense. But well, that is the theme of Rokoko. The theme is really out there and not very appealing to me in all honesty, but from a gameplay standpoint, Rokoko does seem to have a lot of interesting elements that might just make it a really fun game. Rokoko’s main mechanics involve resource / set collection, area control and a deck management system that is interwoven within all aspects of the game. Each player starts with a basic deck of cards which will dictate what actions the player may perform, and also what benefits the player may use on their turn. It’s tricky to explain without a visual but the gist is that there are 3 worker types that may appear on a card. The worker type determines what action the player may take ( the best worker type allows the player to choose any of the 6 actions, the 2nd type allows 5 of the 6 actions, and the last type allows only 3 of the 6 actions to be carried out ). Apart from that, each worker type may also come with an ability that lets you enhance a particular action you are taking. So the cards are a very important aspect in the game and have a hand in all you do in Rokoko. The 6 actions that players may choose from each turn are: being first player next turn, purchase resources, make a dress, hire new employee ( get more character cards ), fire an employee ( cull your deck ), and fund a decoration. 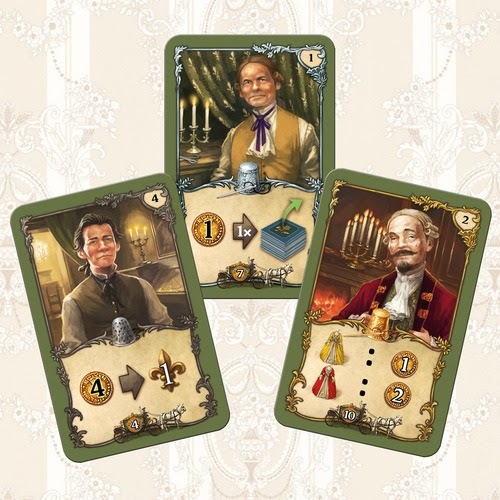 So using the cards at your disposal, you are attempting to gather sufficient materials ( resources ) to make a dress and either sell it for cash, or rent it out to the guests of the ball. Selling it for cash allows you to fund more decorations that award you with points and ongoing or end game bonuses. Whereas renting it out to guests allow you to place your marker on certain areas of the board to claim end game bonuses by having a majority. There are other fine details in the game that make the decisions for each action tough. For example, when purchasing resources, each tile depicts 2 options, do you want silk or do you want yarn ? Well, you will need both for a dress so choose wisely, what you need may not be available the next time around. Even when hiring employees, if you were to hire first you will pay more than those who hire later, so do you wait and pay less for a not as valuable employee? Or do you stick your head out for that awesome bloke who will no doubt do wonders in your dressmaking business? The reason Rokoko seems like it might be a fit for me is that I find it appears to be very Feld-esque. 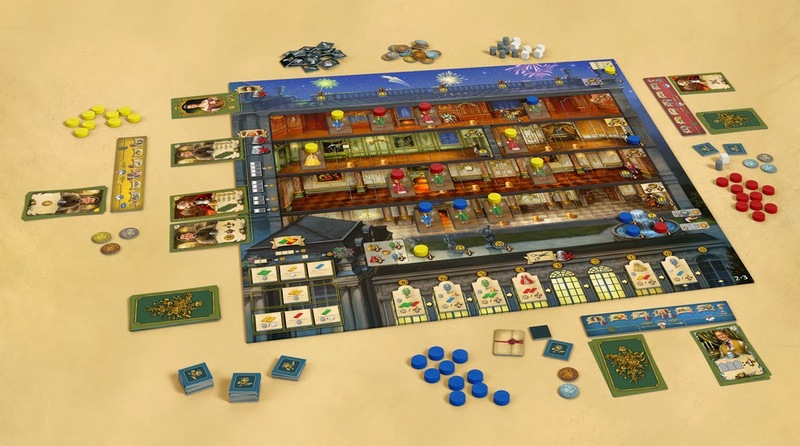 Money and actions seem very tight in the game and everything is very connected by means of the cards ( like how Feld uses dice in Castles and Bora ). Coupled with the end game scoring, race for area control, and points for being literally everywhere on the board, very familiar ground indeed. Rokoko is not available for pre-order, which is just as well, then more reason for me to try before I buy. Was never a fan of impulse buy for fear of lack of availability. 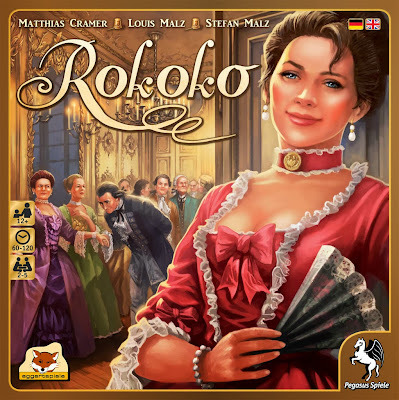 Eggertspiele, Pegasus Spiele, I hope you have sufficient “changing room space” for us to give Rokoko a whirl and a twirl. Thanks for a great overview of the game. Eagle Games will have this game available in North America as an English Version (Rococo) in early November and at BGG Con. You can pre-order it now on www.eaglegames.net. By the way, although the Master can do any action, the journeymen and apprentices have better secondary actions! read through the card abilities but without a play cant really tell how significantly better the secondary actions are. nice to know that that will only make the decisions even harder ! unfortunately we are based in Singapore, so a USA preorder doesnt really make it easier for us to get our hands on a copy. Jonathan, eggertspiele will reserve the powder room for you.